Winter weather changes the photographic landscape. As an English novelist, J.B. Priestly may have never traveled to Texas, but his eloquent words ring true for many of the state’s varied and iconic landscapes that can be transformed on a single winter’s night into an enchanted, snowy wonderland. These landscapes become visual poetry as normally rugged, earth-toned terrains are now contrasted against a now-delicate sea of white. This contrast can provide great photographic opportunities if you’re prepared to capture the usually short-lived event by venturing out on a bone-chilling, finger-numbing day. 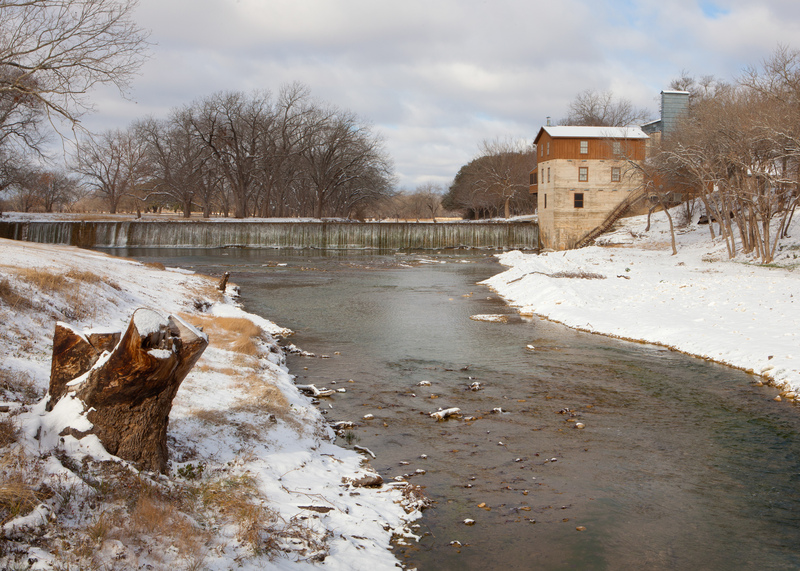 Here are a few helpful tips for shooting snowy landscapes in Texas. Unlike in many northern and mountainous western states, a snowfall in Texas dissipates quickly. Too often we hear about a beautiful snow in another part of the state and pack up the cameras to head that direction, only to find that it has melted by the time we arrive. The trick is to try to “lead” the snowy weather by a day or two in order to be staged and ready to shoot. It’s often a hit-or-miss proposition depending on the accuracy of the weather predictions. The payoff can be that once-in-a-lifetime photo. Texas is blessed with many great locations for winter landscapes, including our state and national parks. Most parks provide some type of lodging and camping facilities — including simple campsites, heated cabins or RV hookups — which make it easy to crawl out of bed, step outside and start shooting. This quick access can make a difference when each minute counts as a pristine snowfall quickly melts. 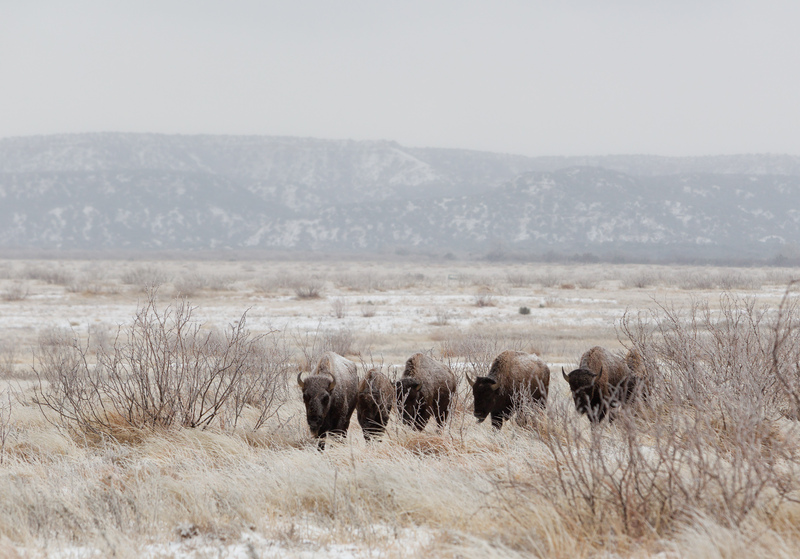 Protected by their thick coats, bison graze at Caprock Canyons. If you’re lucky and temperatures stay low, the fallen snow may hang around a day or two. This can afford a different look to your images as blue skies offer an alternative to cloudy, diffused skylight, especially when contrasted against reddish rocks such as those in the Texas Panhandle and Big Bend regions. There is no “best” light. Each has its own mood. But it isn’t all about the landscape. Snow can also provide an artistic backdrop for wildlife photography as animals go about their daily routines. From predators searching for prey to colorful birds searching for seeds beneath the white blanket to whitetail bucks sparring for dominance, a fresh snow adds a new dimension to ordinary wildlife photos. Animals often display unique behaviors such as inquisitiveness and playfulness as they explore their new surroundings. However, as beautiful as a snowscape can be, certain precautions should be taken when working in the meteorological conditions that accompany it. Obviously, sufficient layers of body, head and feet covering are essential for retaining body heat. Natural or manmade fabrics that “wick” moisture away from the body are ideal. Gloves should keep hands warm enough while still allowing dexterity to change camera settings. I’m a fan of Army surplus woolen glove liners. Driving should be limited to dry, well-maintained roads. Ice-covered roads are unpredictable and dangerous. While a four-wheel-drive vehicle is preferred, driving should still be done with caution, especially in locations with moderate to steep inclines. In the heaviest snows, be prepared to deploy tire chains. Winter has come to Texas! Brrr-ing on the snow! 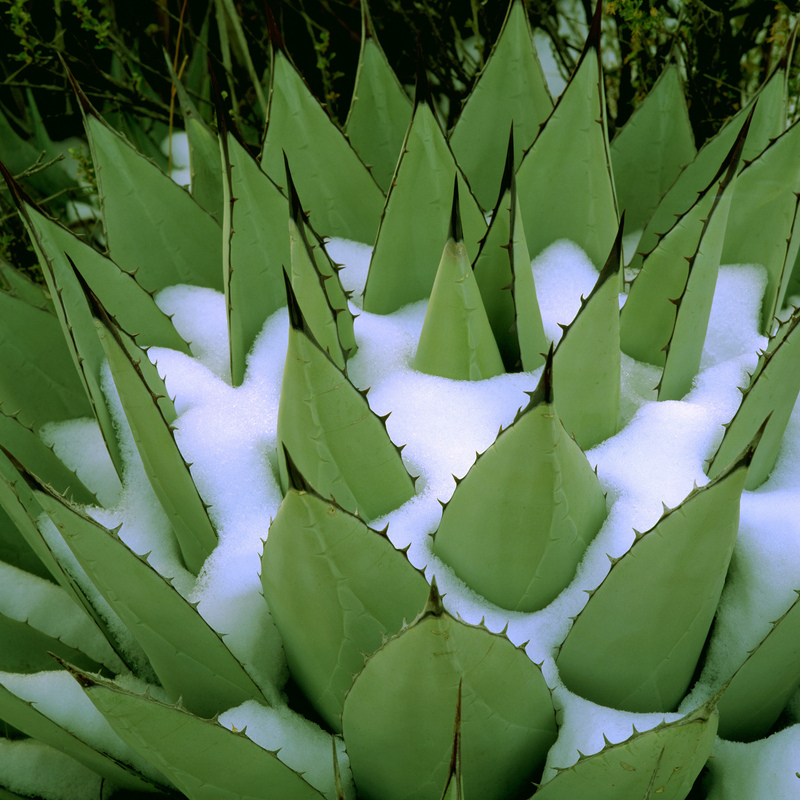 Snow provides a contrast to a thorny agave in the Guadalupe Mountains.